LONDON--(BUSINESS WIRE)--The latest market research report by Technavio on the global technical support outsourcing market predicts a CAGR of around 8% during the period 2018-2022. The report segments the global technical support outsourcing market by type (helpdesk and call center) and by geography (the Americas, EMEA, and APAC). It provides a detailed illustration of the major factors influencing the market, including drivers, opportunities, trends, and industry-specific challenges. The increasing need for cost-effective solutions to improve efficiency is one of the major factors driving the global technical support outsourcing market. At present, consumers are increasingly demanding for easy, fast, and convenient services. Consumers expect services to be available 24 hours a day and 365 days a year. If enterprises are unable to meet the consumers' service requirements, they are likely to lose clients to their competitors. In the technical support outsourcing industry, customers sometimes terminate their relationship with enterprises due to poor technical support services and move their business to competitors. Technical support agents could request a caller to stay on hold sometimes so that he can retrieve the relevant data to resolve an issue. A slight delay in responding can result in the caller looking for other companies, which can solve the issue. Technical support providers are striving to integrate chatbots into their processes because they will have to look beyond human agents to handle simple customer queries and provide better solutions in the future. Good customer service can result in business success. Chatbots will assist enterprises in responding to the customers instantly. Chatbots can skip dependency on the repair personnel and directly provide responses to the customers and save time. The integration of chatbots into technical support outsourcing will aid in improving the customer experience. APAC dominated the global technical support outsourcing market by contributing to approximately 52% of the market share. It was followed by the Americas and EMEA. The market share of APAC is expected to increase significantly during the forecast period. However, the Americas is expected to witness a decline in its market share and growth rate during the forecast period as this region is an early adopter of IVR technology and it has reached saturation. Also, it typically outsources its technical support service to countries such as Brazil, India, and China because of their low-cost labor and strong knowledge base. Technavio’s analysts and industry experts will work directly with you to understand your requirements. Technavio offers USD 1,000 worth of FREE customization at the time of purchase. 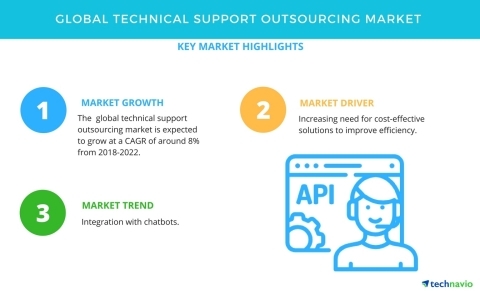 The latest market research report by Technavio on the global technical support outsourcing market predicts a CAGR of around 8% during 2018-2022.